Volatility remained in November, but a late-month rally lifted equities into positive territory for November. Treasuries increased during the month, but corporate bonds declined in value as credit spreads widened. The U.S. and China appeared to agree to pause the trade war at the G20 meeting in Argentina, which set a more positive tone for markets heading into the New Year. U.S. economic data released in November continued to show ongoing growth in the U.S. economy. Despite elevated market turbulence, we believe that fundamentals continue to reflect a solid economic backdrop. Equities went on quite a ride in November. Following the worst month in years in October, the S&P 500 rebounded sharply at the outset of November only to slide back down, hitting the lowest closing level since April. However, equities picked up momentum once again later in the month, boosted in part by a change in tone by Fed Chairman Powell This resulted in gains overall in November. Compared to much of the late summer and early fall, volatility remained elevated. But it did not hit the levels seen during the market sell-off in October. Large cap equities fared better than small caps during November, but the disparity was not as pronounced as was the case in recent months. The numbers for November were as follows: the S&P 500 gained 2.04%, the Dow Jones Industrial Average rose 2.11%, the NASDAQ Composite advanced only 0.49%, and the Russell 2000 Index increased 1.59%. Growth stocks, as measured by the Russell 1000 Growth Index, lagged value stocks, as measured by the Russell 1000 Value Index, gaining 1.06% and 2.99%, respectively. 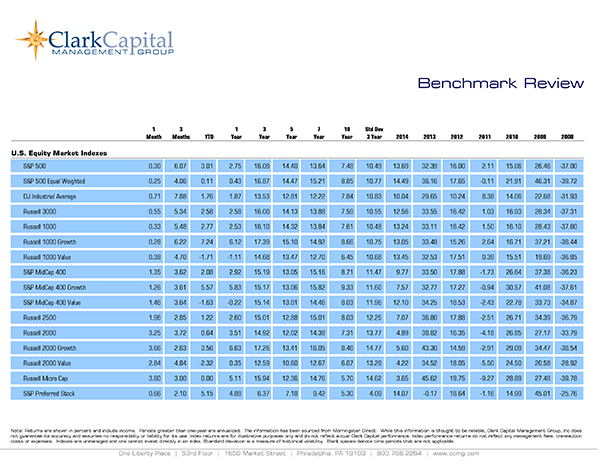 However, growth still enjoyed a clear advantage over value on a year-to-date basis from a style perspective, as did large cap stocks compared to small cap stocks. International equities posted gains in November, with emerging markets bouncing back after some of the weakest results of any asset class throughout the year. The positive news out of the G20 meetings largely occurred after the final trading day of November, but markets started December off strongly after a trade war truce between the U.S. and China was announced. Emerging market equities, as measured by the MSCI Emerging Markets Index, gained 4.12% over the month. While this was one of the best overall asset classes in November, emerging market equities remain one of the weakest asset classes in 2018. The MSCI ACWI ex USA Index, a broad measure of international equities, gained 0.95% in November. Both of these indices are still down double digits on a year-to-date basis in what has been a very difficult year for international equities following strong gains in 2017. The yield on the 10-year U.S. Treasury declined during the month from 3.15% to 3.01%. Yields on treasuries maturing in one year or less increased, and as a result the yield curve flattened significantly during November. The three-month to 10-year Treasury spread decreased to 64 basis points from 81 basis points. The decline in yields beyond the one-year maturity point created a more constructive backdrop for most fixed income sectors, with the exception of corporate bonds, and most notably high-yield bonds. For much of the year, high-yield bonds had been one of the few pockets of strength in fixed income, but this bond sector had some of the sharpest declines in November with the Bloomberg Barclays U.S. Aggregate Corporate High Yield Index declining 0.86% during the month. Despite those declines, high-yield bonds remained fractionally positive on a year-to-date basis, up 0.06% through the first eleven months of 2018. 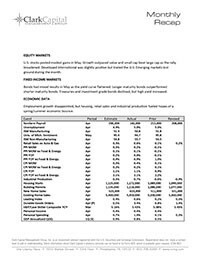 The declining rate environment helped the U.S. Treasury market show gains across the board during the month. Overall, the Bloomberg Barclays U.S. Aggregate Bond Index gained 0.60% and the Bloomberg Barclays U.S. Credit Index slid modestly lower, down 0.07%. TIPS and municipal bonds also gained during the month. Outside of high-yield bonds, municipal bonds, and the front end of the U.S. Treasury curve, most bond sectors remained in negative territory heading into the final month of the year. The widely followed Bloomberg Barclays U.S. Aggregate Bond Index is down 1.79% so far this year and should returns stay negative to close out 2018, it would mark only the fourth time since the index’s inception in 1976 that this index has recorded a negative calendar year. Economic data released in November largely continued to reflect ongoing strength and growth in the U.S. economy. However, broader macro concerns, like the pace of rate hikes by the Fed and ongoing trade issues with China, seemed to be the overriding focus of investors. This led to another choppy month of market action. The most recent reading of the Institute for Supply Management (ISM) manufacturing index in October remained elevated at 57.7, but it was below expectations and a decline from September’s mark. However, the ISM non-manufacturing index, which represents the much larger service industries in the U.S. economy, exceeded expectations, coming in at 60.3 in October compared to estimates of 59.0. This marked the second month in a row this index was above 60, and readings above 50 indicate economic expansion. Non-farm payroll additions of 250,000 in October blew past expectations of 200,000 and continued to reflect strength in the labor market. The unemployment rate stayed at 3.7% as expected. Reflecting a tight labor market, wages increased in October with average hourly earnings rising by 3.1% on a year-over-year basis, matching expectations, while the labor force participation rate increased unexpectedly for the month. The Conference Board’s leading economic indicators index (the Leading Index) rose modestly by 0.1% in October but was in-line with expectations. Retail sales were better than expected on a headline basis, but excluding autos and gas, retail sales advanced by 0.3%, which was below the anticipated 0.4%. This was likely driven by the precipitous drop in oil prices that began in early October. The second reading of Q3 2018 GDP growth remained at 3.5% as expected. This follows Q2 2018 GDP growth of 4.2%, which was the strongest GDP reading since 2014. The Federal Reserve has come under scrutiny of late by the President and by some market commentators regarding the pace of the rate hike cycle. As the Fed was blamed in part by some for recent market weakness, it was no surprise that perceived “dovish” comments from Chairman Powell late in the month were received positively by the market, and this led to a late-month equity rally. The Federal Open Market Committee (FOMC) met in November and left rates unchanged as expected. Although the market anticipates one final rate hike for 2018 at the December FOMC meeting, a more gradual pace of rate hikes is also expected in 2019 and any comments regarding the Fed’s thinking on this front will be monitored closely. We continue to expect a measured rate-hike cycle.